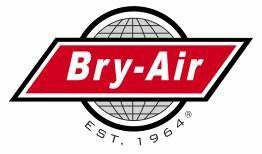 Bry-Air, Inc. environmental control systems allow for consistent control to efficiently prevent the effects of humidity on yeast. The story of yeast is as old as the story of bread. For centuries, yeast has been associated with bread making as a fermenting agent. The origin of bread, though vague, dates back to the Stone Age. Flat breads were quite common in the late Stone Age while raised breads developed around 4000 B.C. Traces of yeast were discovered in beer jars and beer breads which were used as offerings in Theban tombs as early as 2000 B.C. Fermentation, originally the result of chance contamination by airborne yeast, was promoted by using a piece of old dough. To this day, this is the method preferred by most prestigious bakers around the world. By 300 B.C. however, yeast-making became a specialized profession. Yeast is now commonly available in packages or foil containers at most supermarkets. However, there is nothing new in its function as a raising agent for imparting that special light texture to the bread that we eat. Yeast is made up of living cells which have the ability to change sugar into alcohol and carbon dioxide. The yeast making process involves growing the organism in a suitable media or culture. The crop is harvested when a sufficient crop of cells has appeared. ‘Saccharomyces Cerevisiae’ is normally used as the microorganism of choice and is prepared in the laboratory as the seed yeast. This is then passed into a clear mineral salt-sugar solution, used as the medium, where fermentation can occur. The temperature is kept constant in order for rapid growth to take place. The yeast cells are then separated from the fluid in which they were grown by a filtering process. At this point, the yeast cells are mixed with starch cells and pressed into large cakes. Fresh yeast can survive only for a few weeks at a controlled temperature of 40 C (39.2°F). Hence, it needs to be stored in specially constructed cold storage facilities. On the other hand, dry active yeast can be stored for up to three years without any loss of physical or chemical properties. The drying of yeast is an intricate process, requiring cold dry air to produce quality yeast without destroying the micro-organism. The quality of the air required for drying yeast must be controlled at a temperature of 12 to -18°F and a humidity level of 10 to 14 grains/1b of air. The ideal condition for the manufacturing of yeasts involves low temperature drying. Although elevated temperatures can result in faster drying times, there is a significant risk of spoiling the product quality. 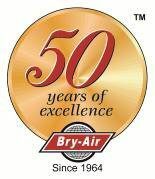 Bry-Air, Inc. desiccant dehumidifiers, when combined in a package with refrigeration, can easily maintain these stringent conditions in the drying areas of yeast manufacturing facilities to produce consistent and quality product results.